This ocean art pendant is directly inspired by the ebb and flow is sea along the shore- a siren song to those who love the ocean. The ocean is captivating in all its forms. From the briny deeps to the shallowest tidepool- each face of the ocean is breathtaking and inspiring. All the world is touched in one way or another by the ocean- and yet so much of it is still undiscovered. Mysterious and overwhelming, or gently lapping on sunlit beaches... the ocean is indescribably wonderful. I see these temporary beauties as a reflection of the multitude of small miracles that make life astonishing. The shifting seas revealing breathtaking beauty, before life sweeps along and reveals something completely different. 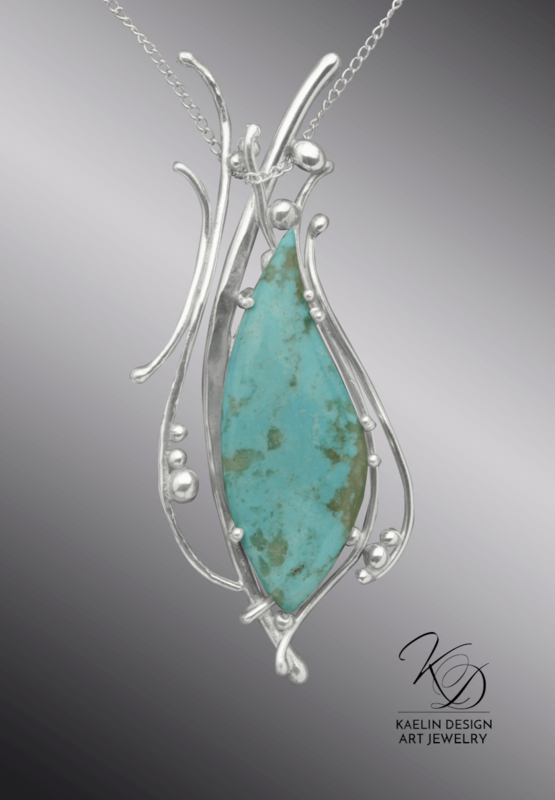 Ocean's Song is hand fabricated in Argentium Silver, fused and formed to frame stunning one of a kind stabilized Turquoise cabochon. This pendant measures approximately 2.5 inches in length, and graces an 18 inch Argentium Silver chain.